There are currently 201 people online. Now that Apple's iPad 3 has hit the market, reviewers are able to put Apple's claims that the A5X SoC is four times faster than NVIDIA's Tegra 3 to the test. DailyTech found benchmarks of Apple's new iPad and the ASUS Transformer Prime (with Tegra 3) over at Laptop Mag and the results are quite extraordinary. Apple's A5X SoC is thought to pack a PowerVR SGX543MP4+ from Imagination Technologies and the graphics performance is definitely a beast, the chip is nearly five times as fast as the Tegra 3 SoC in the GLBenchmark 2.1 Fill Test! 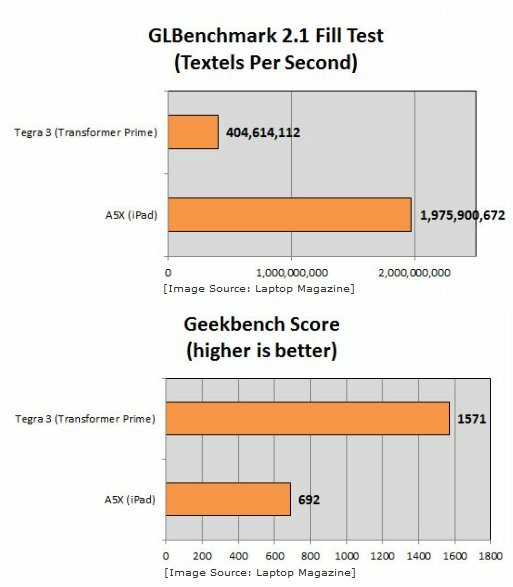 However, while the new iPad scores better in gaming, the Tegra 3 scores much better than Apple's A5X in a CPU benchmark like Geekbench, where NVIDIA's chip is 2.25x faster than Apple's SoC. But unfortunately for NVIDIA, Apple's new iPad still comes out faster in browser benchmark Sunspider.